"I can with great confidence recommend The String House as an outstanding resource in Rochester, NY. They have repeatedly provided my students and colleagues with a fine selection of quality instruments and bows helping them to advance in their musical careers." We feel extremely fortunate to be able to provide an immense selection of finely restored old violins. Our instruments are not only visually attractive, but also exceptional in tonal quality. 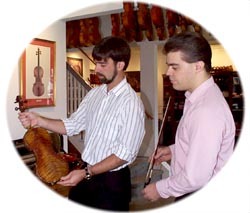 Our very selective purchasing allows our clients the freedom to choose an instrument of only the highest quality. Below is a listing of some instruments which constitute a constantly changing inventory. F. Contal 1935 16 1/2"
Ant. Stradivarius Copy 15 1/4"
Gunther Seitz 1932 16 1/2"
Joseph Marshall 1973 16 1/2"
Joseph Marshall 1983 16 13/16"